Our logo has stayed largely the same the last 5 years. While the mark served us well, we felt it was time to reimagine our visual identity. Our company has matured, providing new services, expanding into new industries, and growing significantly – shouldn’t our visual identity reflect where we are today? We dropped some of the old typography. While Harabara has served us well, we wanted to use a font that reflected our appreciation of traditional typography while embracing a modern, updated approach. Klinic Slab, the slab serif we selected, can walk the line between professional and whimsical, serious and creative. We have always been storytellers at Catchfire. When we first began, we used a flame to literally represent how we turned up the heat on our client’s marketing efforts. The problem was that it was a bit too literal. As time went on, we wanted to find a way to visually convey what we do without feeling restricted. Recently, we have focused not just on telling a good story, but elevating it. We work with our partners to understand their perspective, passion, and market position to convey their story in a way that connects with their audience. Our new mark reflects that commitment with an elevated “c”. Sure, some flames are red, but the hottest part of a flame is blue. We like to think so. 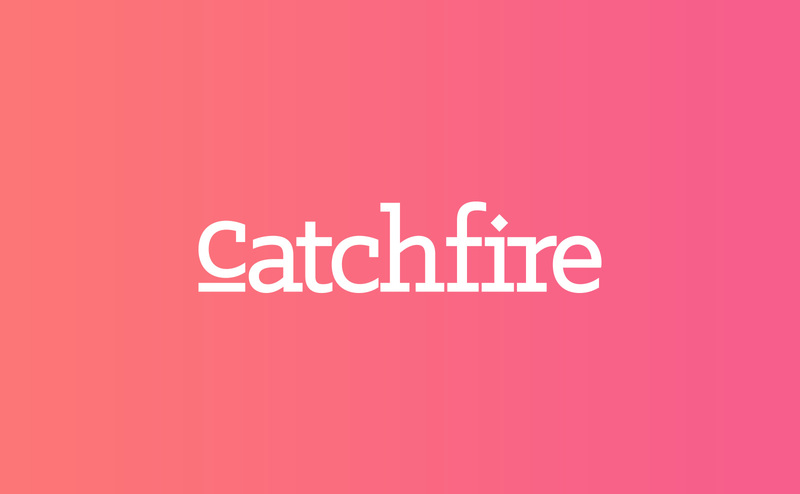 We dropped the word “Creative” from our official branding because no one called us Catchfire Creative – employees, clients, and acquaintances alike all referred to us as Catchfire. We just thought we’d make it official.